When twenty-four-year-old Susannah Cahalan woke up alone in a hospital room, strapped to her bed and unable to move or speak, she had no memory of how she’d gotten there. Days earlier, she had been on the threshold of a new, adult life: at the beginning of her first serious relationship and a promising career at a major New York newspaper. Now she was labeled violent, psychotic, a flight risk. What happened? In a swift and breathtaking narrative, Susannah tells the astonishing true story of her descent into madness, her family’s inspiring faith in her, and the lifesaving diagnosis that nearly didn’t happen. In August 2013 I actually attended Cahalan’s appearance in Kansas City for an author event sponsored by Rainy Day Books. She was bubbly and personable, and there was a particularly sweet moment when, during the Q&A, a mother expressed her gratitude at Cahalan’s book raising awareness for neurological diseases such as these, of which her young daughter suffered as well. The girl was there too, and Cahalan took her up on stage to sit with her. 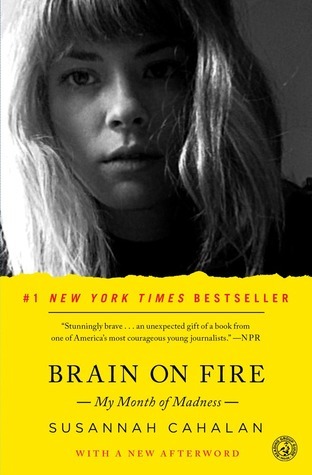 Brain on Fire is an interesting read—her descent into “madness,” to the bafflement of many doctors, was harrowing and shocking. The best part is that Cahalan brings to light the prospect that perhaps those with undiagnosed “mystery” illnesses, or illnesses such as schizophrenia or autism, say, may actually have a disease that’s treatable and curable. How many people have died in situations like the one Cahalan faced? The brain is a fascinating and enigmatic subject. While I do think the pacing and layout was done well, the writing lacked in places for me. Some of it was repetitive and some of it felt like trying to hard to be literary, like the book couldn’t decide whether to be a narrative memoir (too many adverb…) or an investigative scientific research piece—admittedly I glazed over many of the scientific descriptions. I also didn’t get a great sense of who Cahalan was before the onset of the disease. A bizarre behavior manifests seemingly out of nowhere, and we just take her word for it that it was uncharacteristic? I mean, yeah, I guess so… I just wish we would have gotten to know Cahalan better beforehand so the unusual symptoms could carry more cause for alarm. I didn’t feel emotionally invested or connected to her. But, if you like the TV show House and have an interest in books about science, health, and mysteries, I think this one is worth a read. Brain on Fire is my first of twelve books read for the 2015 TBR Pile Challenge. Read from January 23 to 25, 2015. This entry was posted in activities, books and tagged 2015 tbr pile challenge, health, memoir, non-fiction, scientific research, writing by kristin @ my little heart melodies. Bookmark the permalink. I’ve been interested in this book for a while, given the bizarre and frankly terrifying nature of hey illness. Sounds like the book can’t decide what to be? I’d say it’s worth the read—well-paced and very interesting. I think if it had taken me longer than just a few days to read, though, I would have perhaps fizzled out on it.